Editor’s Note: This is the latest in a series of sponsored posts by Oh-Holidays.com based on my first backpacking trip to Europe. In Dublin's fair city, where the girls are so pretty, I first learned to appreciate stout beers. Guinness, to be exact. I've never been particularly adept at distinguishing the nuances and flavors of different beers, which might explain why I can so easily appreciate Guinness. A thick, dark stout, with a creamy head. It's incredibly easy to tell a Guinness from any other beer. A proper pint is like a meal unto itself. And in Ireland, I was all too happy to get my fill. 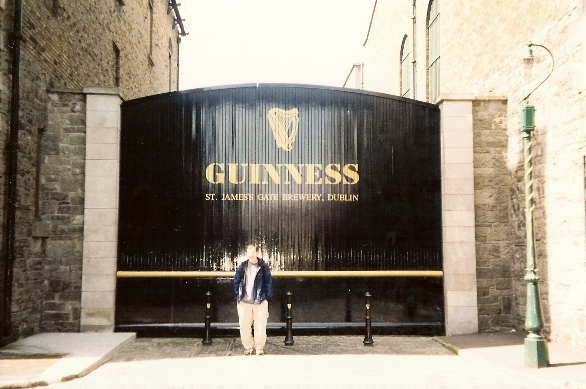 My introduction to Guinness began at the source, St. James Gate Brewery. The date was August 18, 1998 and the cost of a self-guided tour with student discount was just $4.50. The brewery tour included a pint at the end, which made it worth the admission. The actual tour itself? Not so interesting, but the gift shops were filled with those wonderful, old advertisements which continue to adorn traditional Irish pubs around the world. Later that night, I paid a visit to Temple Bar, the epicenter of Dublin's nightlife, at least back then. There were two main pub crawls to choose from – a literary one, and a musical one. As much as I enjoyed James Joyce in high school, I opted for the musical pub crawl. The crawl was lead by Anthony, who played the guitar and bodhran, and Nell, a pretty young lass who played the fiddle. Together, our merry band visited three pubs. In each new venue, we drank pints of Guinness and tried our best to sing a long to the traditional Irish songs. By the end, I was sufficiently intoxicated to drop $15 on a signed CD. As touristy as the pub crawl might sound, it was a highlight of my two week jaunt through Ireland. During the rest of my stay in the country, I looked for every opportunity to hang out in pubs, drink Guinness (and later Kilkenny), and listen to the trad music. Ireland was the last country I visited on my first backpacking trip to Europe, and I toted home a can of Guinness and Jameson whisky from Dublin as a reminder of the experience. I declared to my parents, upon my arrival back in the States, a desire to have been born Irish. Like Italy, I always imagined I'd have gotten back to Ireland again a lot sooner. It was costly then, and it's only become more expensive in recent years. If I do return at some point, I'd look into renting one of the self-catering apartments in Dublin to try and keep costs down, and give me a private place to base myself. really enjoyed the blog. As an Irish person living in post boom/ mid recession Ireland I can honestly say the expensive Ireland is definitely over done, especially in comparison with US cities I have recently visited (i.e. San Francisco, NY and Chicago). It is not the cheapest place in the world, but if you take on board some advice from a local, living in Dublin and the rest of the country can be a lot cheaper than $60 per day. Tip 1……buy your midday meal in a shope like Spar/ Centra. these shops generally have deli counters where one can buy a really filling sandwich for about €3.50. Often there are deals where one can get a drink and a bag of crisps thrown in for free. If something is too expensive……walk away!!! Tip 2……Lunches are generally very cheap in any restaurant in Dublin, 2 courses wil cost about €10-12. This compares very favourably to lunch costs in other countries in my experience. Tip 3…. If you prefer to have your main meal in the evening time, look out for ‘early-bird’ deals outside practically every restaurant in Dublin. The only catch is this offer usually only lasts until about 7.30pm. However, on Monday, Tuesdays and Wednesdays this offer can be all night. To avoid getting stung ask the waiter/waitress and don’t take any nonsense! Irish consumers are very focussed on value these days, if you visit our country, you should be too!! Tip 4….check the groupon, menupages, pigsback, citydeal websites for excellent deals in really good restaurants around Dublin! If you do come, please remember, we love talking to strangers, we are interested in you and in your stories and experiences, please share them with us…that way we all benefit from your tourism!! If my email address is visible, please feel free to drop me a line if you want or need any advice or pointers! Thanks for the tips! I’d love to get back to Ireland again. I am a Dubliner living in Naples, Florida. It was great to see some news of Dublin, especially about the Guinness brewery.. Guinness should give me a pension because I’ve supported them for so long. I left Ireland in the fifties, when the unemployment rate was about 18%, to make my fortune in London. The Londoners told me to go back to Ireland so I went to the US instead. They actually like the Irish here. I’ve subscribed and I’m looking forward to Emails. Hi Neville, thanks for reading, and subscribing. I love brewery tours, even if I find the beer undrinkable, like I do with Guinness.